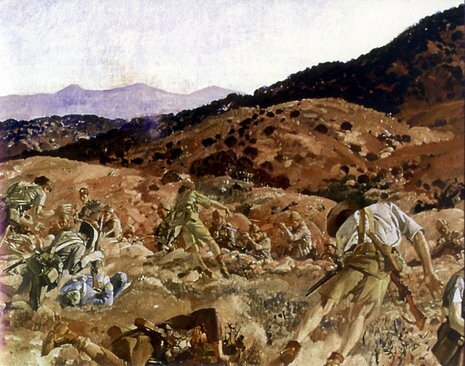 The Battle of the Nek was a small World War I battle fought as part of the Gallipoli campaign. This is the battle described in the film "Gallipoli" starring Mark Lee (and would launch Mel Gibson to stardom). "The Nek" was a narrow stretch of ridge in the Anzac battlefield on the Gallipoli peninsula. The name derives from the Afrikaans word for a "mountain pass" but the terrain itself was a perfect bottleneck and easy to defend, as had been proven during a Turkish attack in May. 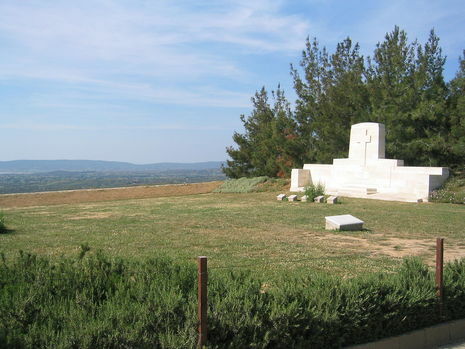 It connected the Anzac trenches on the ridge known as "Russell's Top" to the knoll called "Baby 700" on which the Turkish defenders were entrenched. In total area, the Nek is about the size of three tennis courts. The force striking for the nearer peak of Chunuk Bair comprised the New Zealand Infantry Brigade. It came within 500 metres of the peak by dawn on 7 August but was not able to seize the summit until the following morning. This delay had fatal consequences for another supporting attack on the morning of 7 August; that of the Australian 3rd Light Horse Brigade at the Nek which was to coincide with the New Zealanders attacking back down from Chunuk Bair against the rear of the Turkish defences. The New Zealanders held out on Chunuk Bair for two days before relief was provided by two New Army battalions from the Wiltshire and Loyal North Lancashire Regiments. A massive Turkish counter-attack, led in person by Mustafa Kemal, swept these two battalions from the heights.